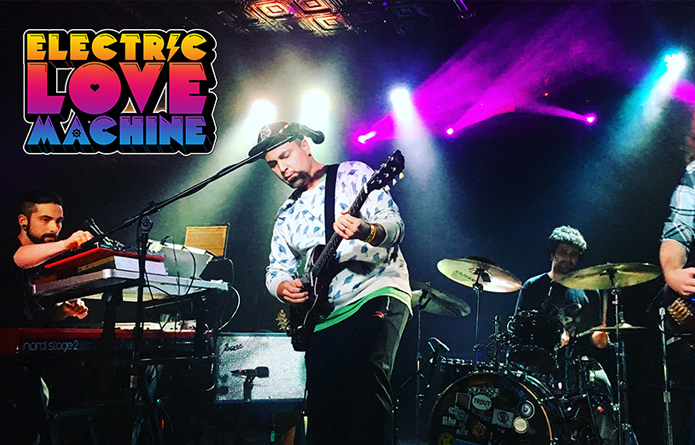 Electric Love Machine (ELM) is best described as an outer space adventure through sound, infused with doses of electronicfunk, traditional Americana and improvisational jazz, and whose foundation is built on a sense of community. Their first full-length album, XenofoneX, touches upon the aural sense, and travels through one’s heart, makes a stop in the brain, all while travelling across the cosmic plane. ELM is part of a dedicated and diverse network of Live performance artists, acrobats, painters, graphic artists, musicians, fashion designers, and music lovers from in and around the Baltimore area who support each other and often perform together to make each show a profoundly unique experience. Flying through their (fair-priced) interstellar journey, their tribe supports ELM not just in their hometown of Baltimore, MD, but also throughout the band’s multiple engagements spanning the Northeast, and future markets in the Southeast, Midwest, West, the Moon, and potentially our neighboring Andromeda Galaxy (dependent on contract negotiations). ShwizZ is a unique cast of characters reigning from New York. Best described as a melting pot of funk and progressive rock, this giant original sound will be sure to put a smile on your face. The band’s variety and depth allows for lovely twists of improvisation and spontaneity spiked with technical prowess and musical complexity. Over the years the group has shared bills with many notables including Jeff Beck, Primus, Jordan Rudess (Dream Theater), Kung Fu, Dopapod, Consider The Source and more. ShwizZ can be found gigging all over the northeast and you won’t be surprised to find them playing at your favorite festival or club for years to come.